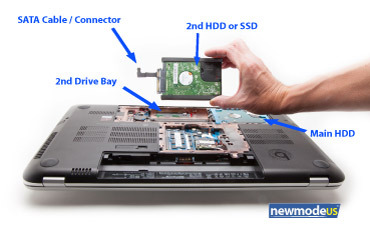 The drive you can install in the 2nd drive bay would be a SATA 2.5" hard drive or SSD with a maximum height of 9.5mm. 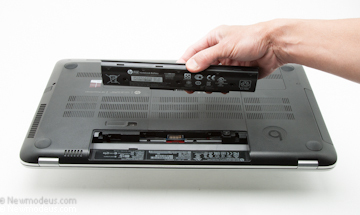 We will begin first by attaching the Rubber Rails to the sides of the HDD or SSD. Shut the laptop down. 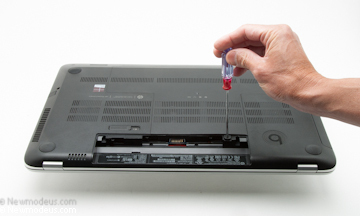 Turn the laptop over and remove the battery from the bottom. Use a screw driver to loosen the one screw as shown in the photo below. 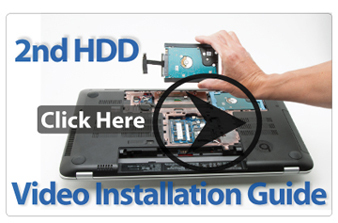 You can now remove the bottom cover of the laptop to expose the drive bays. Note that the bottom cover has little tabs on the sides that hold it in place. Gently pull as you remove the bottom cover. Unplug the "clock battery" (also known as CMOS battery) as shown in the photo below. Note: this is an optional step, it makes installation easier. When unplugging the clock battery, you may have to reset your clock / settings once you are done with drive installation. Install the 2nd hard drive or SSD in the 2nd drive bay of the HP laptop. Please note orientation as shown in the photos below. Slide drive into the bay connector side first. 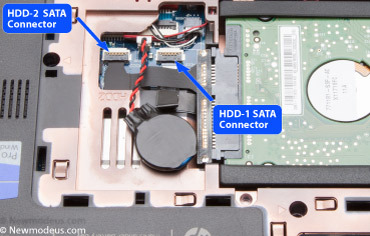 There is a small cover / "door" on the 2nd SATA connector. 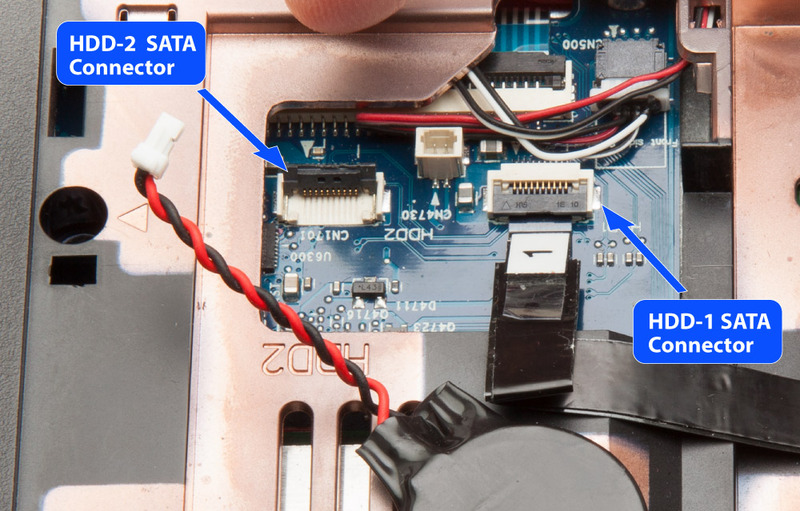 If it is not lifted, gently lift up to expose SATA connector. 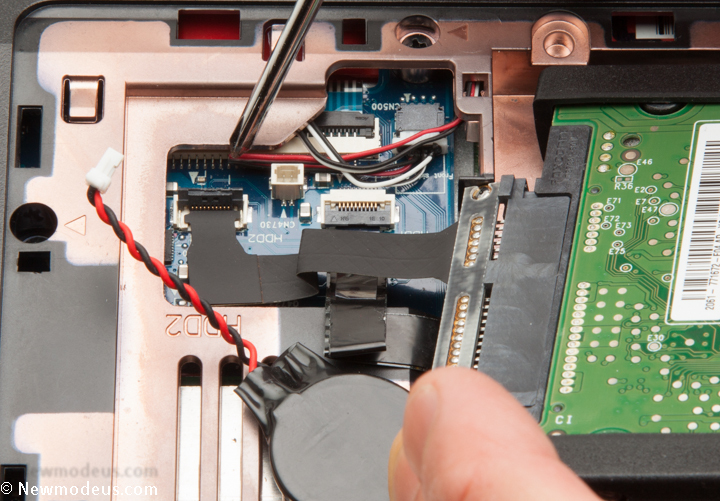 Carefully insert the flat edge of the cable into the SATA connector slot as shown in the photo below. 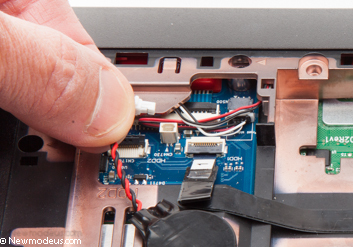 Once the flat edge of the cable is in place, gently close the cover/door of the SATA connector. This will lock the cable in place. Then don't forget to replug the "clock battery" / CMOS battery that was unplugged earlier. For reference, you can compare the connection to the main SATA connector to the right of the 2nd SATA connector. The photo below illustrates how the cable connections should look like. Installation is complete! Re-attach the cover and battery and you are ready to go.